William Mahin, his father David McIntire and friend Doug Jensen were on a bluewater dive trip where they visited three offshore FADs looking for big game. Using a kahala for bait, William lured a mahimahi close enough to spear at DD-buoy and David also got one. Their bluewater dive over, they stopped at Uaoa Bay where William switched to a Riffe Island speargun and a three-prong. 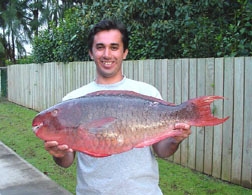 He pronged an 8-lb parrotfish, then headed for deeper water. In 50 feet of water, he located this enormous 18-lb 1-oz redlip uhu and nailed it. As he drifted back toward the boat, William speared two 'omilu (bluefin trevally) with one shot and an uku (gray snapper).